Photo from Peter Stamper, grandson of the two man. Victoria led the race from the start winning by 3 lengths from NSW and a further two lengths back to Queensland. Until the last half mile when NSW broke away from Queensland, it was a tight race for second place. 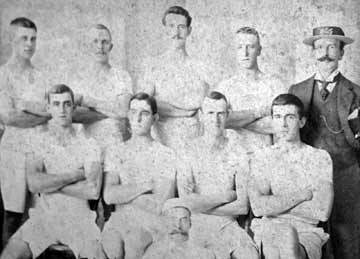 The NSW crew was affected by withdrawals with the Sydney Rowing Club demanding that they be selected without change. 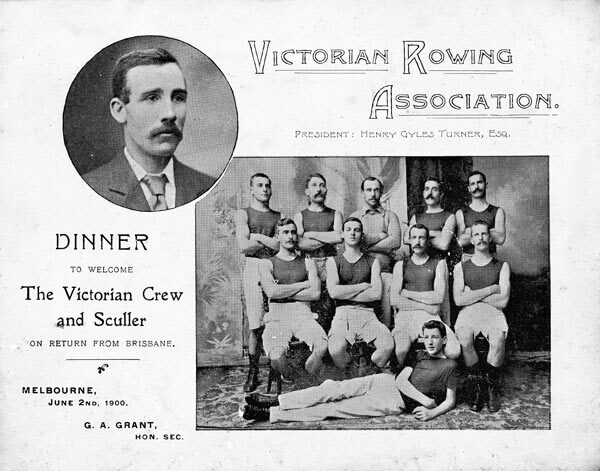 The Sydney Rowing Club oarsmen withdrew and only after considerable pressure, Cater of Sydney agreed to row. The sculling race was won won easily by Slack. The Queenslander of 19th May 1900 reported. Mr. Arthur Drury steered the Queenslander, and Mr. J. Donald directed his brother's course. Slack was out first from his shed at Queensport, and it was noticed that he wore his club colours. He looked in splendid trim, being bronzed and muscular. Donald soon made his appearance, and there was no doubt about his condition. Great interest was manifested in the race, as the competitors occupied different classes of boats, Slack the stump outrigger and the Victorian the long boat. At half-past 3 the word " Go" was given, both men dashing away at a great rate. Slack caught the water first, Donald being slow at getting away, but he rowed the faster stroke, and put in 39 strokes to Slack's 35 in the first mlnute. Passing the first jetty, at the quarter-mile, Slack was slowly drawing ahead, and at the half-mile from the start was a clear length ahead. Nearing the Chemical Works, Slack maintained his lead, and appeared to be rowing well within himself. Donald was still sculling well, both men rowing at 32. Slack was now going away, and had a lead of two lengths. Approaching the mile point, Slack went still further away, and, going along to the mile point, which was passed in 6min. 20sec, he had a lead of four lengths. Donald was sculling gamely, but he was not good enough for his opponent, who had the race from this point well in hand. The race now resolved itself into a procession, the Southerner being out of it, and, letting go with one hand to wet his left scull, he plugged along stolidly at 27 to the minute. The spectators of course lost a lot of interest in the contest, Slack at Cairncross's Buoy being ten lengths ahead, and passing on to the two-mile point, (which was negotiated in 14min. 30sec, the visitor was a quarter of a mile astern. Slack was paddling at 27, and Donald now began to brighten up, and increased his rate of stroking to 29, but, of course, it was of no avail. The Queenslander eventually passed the winning post, rowing 25 to the minute, in 23mln. 23sec, fully a quarter of a mile ahead.